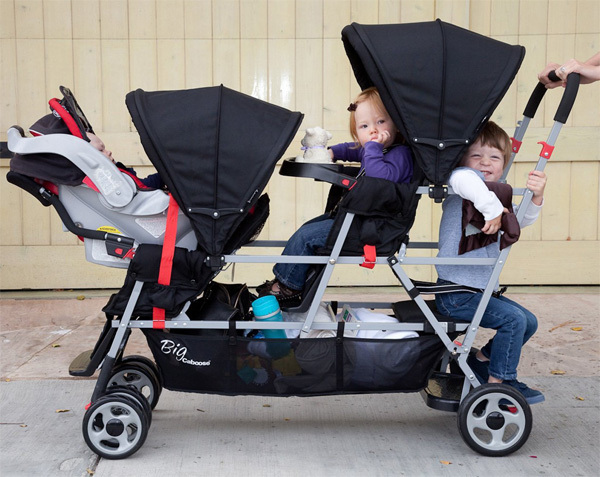 Joovy has created the Big Caboose Stand On Triple Stroller to allow the whole family to head out together. The stroller for three features two tandem seats will full coverage plus a rear platform for the third child, giving them easy access to mom or dad. The platform allows for standing or sitting, so your little one will always be comfortable. 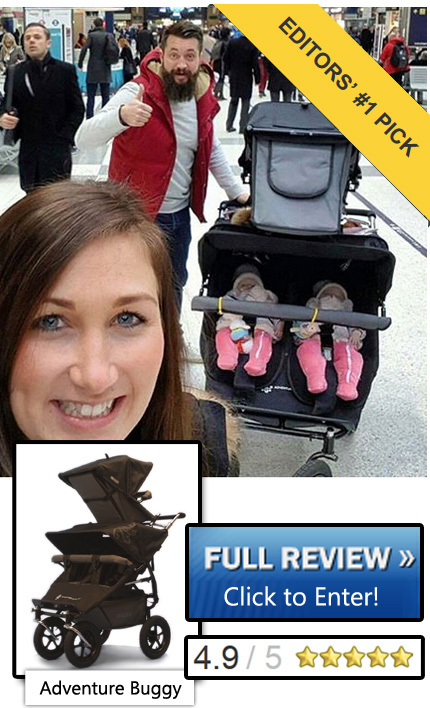 This stroller has very mixed rating because of its size and heft. 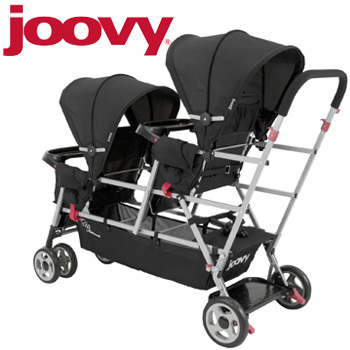 Joovy is a great stroller for families with three small children and a tight budget. 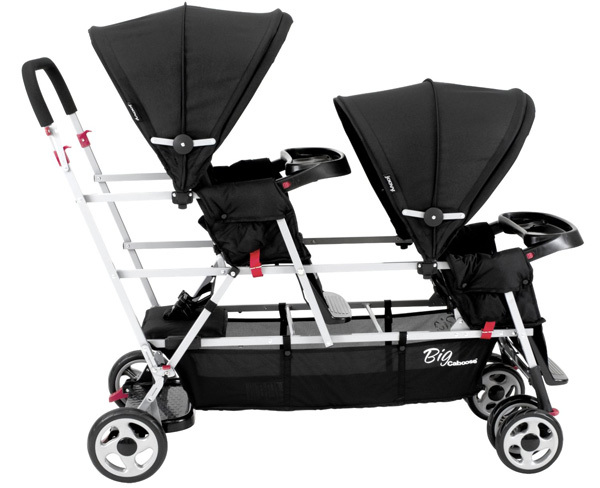 It’s on par with strollers that range in the $600 to $800 price, but it will run you around $300 to $400. The biggest win for most parents is that this stroller can fit two car seats and it supports most car seat models available (Includes two universal car seat adapters accepts most major brands). This is a pretty rare find for something that can still easily get through most doors. When car seats are being used, the stroller won’t fit the trays. The trays are nice, however, since they come with two cup holders and are stable as you walk around. Everyone gets plenty of room in the stroller, even the child in the back tandem area. While that’s good it does mean the stroller is bulky and may not fit in everyone’s car. We’ve included the dimensions of the stroller below because it’s large and worth checking before you make a purchase. You’ll need a few muscles to get yourself going when it’s loaded up, but it is very sturdy and most reviewers say it feels safe. Some users say the front wheel locks are easy to engage, so they have trouble turning and moving if they accidentally turn these on. The biggest thing to note about this stroller is its size. The length will be a bit of a surprise to anyone new to Joovy, but it has good turning for the size. Unfortunately, anything with three children sitting in a straight line will have some issues turning on a dime. The two main seats recline and include a reflective covering and canopy that can help with the sun during the day and give you added visibility if you’re out walking at night. 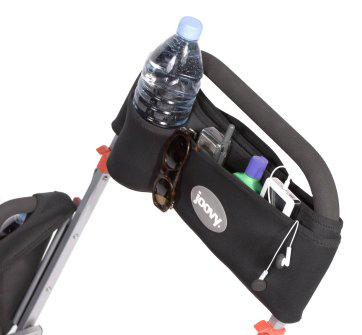 Joovy offers a few different accessories to help you out, but you’ll want to look at the company’s “Parts” webpage to make sure you’re getting the right item for your stroller. Just above everything on the Caboose has a replacement available, so you can fix anything that gets damaged or swap out seats to get a new color. The car seat adapters are included in your purchase (Two universal car seat adapters accepts most major brands). Users also were big fans of the Parent Organizer (sometimes also called the Cool Essentials kit). It attaches to the handle and has pockets for water, keys, cell phone, iPod/smartphone, and more. A few of these zip, so there’s little risk of losing something along the way. 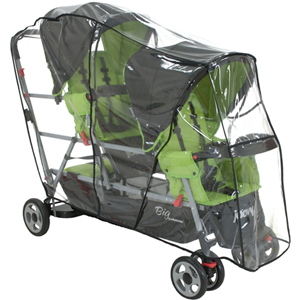 The Joovy Big Caboose Rain Cover is another accessory available. There are a couple more options to make the stroller more lightweight, such as swapping out for a lighter canopy ($30) or a seat ($50), but reviews of these are pretty mixed. This stroller is good for moms and dads who don’t mind pushing around its weight and have checked that its folded measurements will fit in their car. It’s heavy, but it is safe and sturdy. This isn’t a jogger, but it is nice for a long stroll with everyone. If you’ve got the muscles and don’t mind the length, it’s also among the best we’ve seen for price and control. 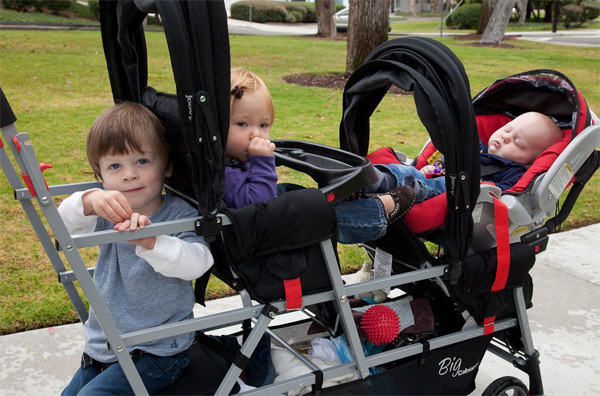 It’s a good two-child stroller as well, because without a third everyone can recline and be seen easily. It’s a bit of a squeeze in most places, but it’ll still fit in elevators and most cars. You’ll get a few looks because of its size, but it provides safe coverage for everyone. Some Amazon sellers include the parent organizer attachment in their description, but the unit itself does not come with this attachment. You’ll need to buy it separately. Yes, a toddler still has room but they may end up sitting and leaning at an angle if your infant seats are especially bulky. Reviewers said that the two main seats are comfortable for everyone. The third seat may cause a concern for some children and it is not made for infants. 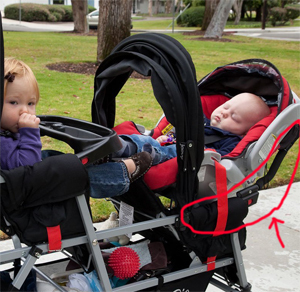 The stroller doesn’t have the usually snap or click-locks of others so it fits most car seats. Essentially it acts like a sling and cradles the car seat, with a strap that goes over the seat to add an extra bit of security. 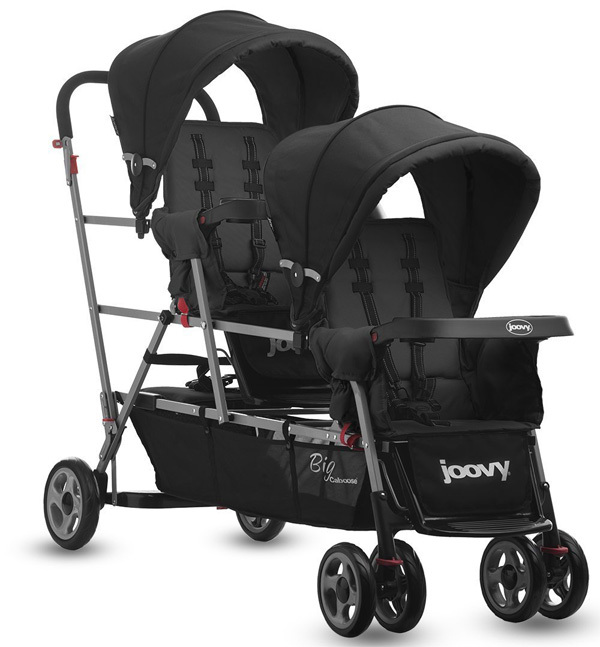 Joovy offers a standard one-year warranty on parts and war for its strollers. The company says that you need to call within 30 days of purchase to get a full refund or exchange. You’ll want to call them first and start the return/exchange process over the phone to make sure you’re covered. Fits two car seats at the same time. Easy to assemble and fold. Third-seat area allows for easy sitting, standing and moving between the two. Accommodates kids who are a few years apart in age. Lots of room in the built-in storage underneath. Sun canopy snaps on and off easily. Padded handle makes pushing comfortable even for the size. It’s heavy. Without kids the stroller is 35 lbs. The third seat isn’t plush. Kids who need a lot of comfort or want to sit for long periods of time may not enjoy it. It can be a little too big for some cars; though users say taking off the shades, trays and other items can make the folded stroller fit in mid-sized vehicles. When putting large items underneath, you’ll want to double check to make sure they’re stored well. Can be difficult to see the front child when using two infant carriers. Positing of the sit-and-stand seat can be uncomfortable for some children, and the seat itself is pushed by the others when using seat adapters. Some users have reported that pieces crack and break in cold weather (below 30 degrees). 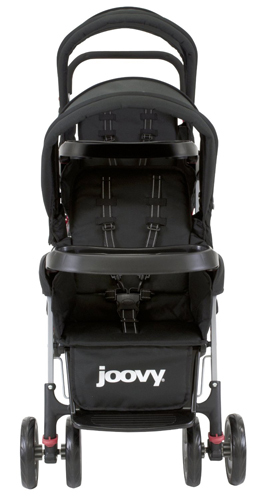 Joovy has been created infant and toddler gear since 2005. It currently offers around 40 products and has an emphasis on ergonomics. It’s one of the few stroller companies that have replacement parts available for just about everything on its strollers, buggies and accessories. 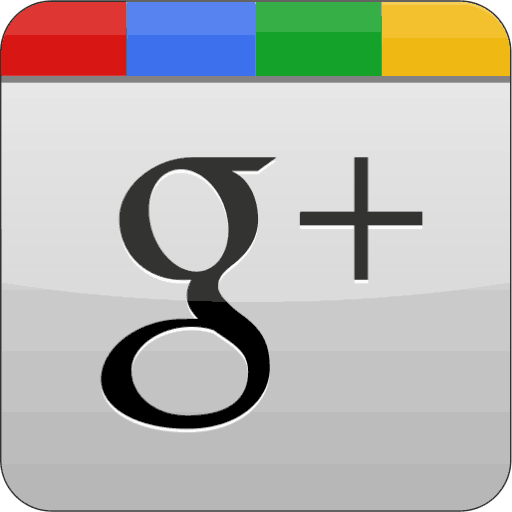 The company gets mixed reviews online when it comes to customer service. 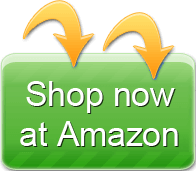 It may be best to buy products through another party or Amazon seller that has their own return policy to avoid the tough process of an exchange or return directly through Joovy. 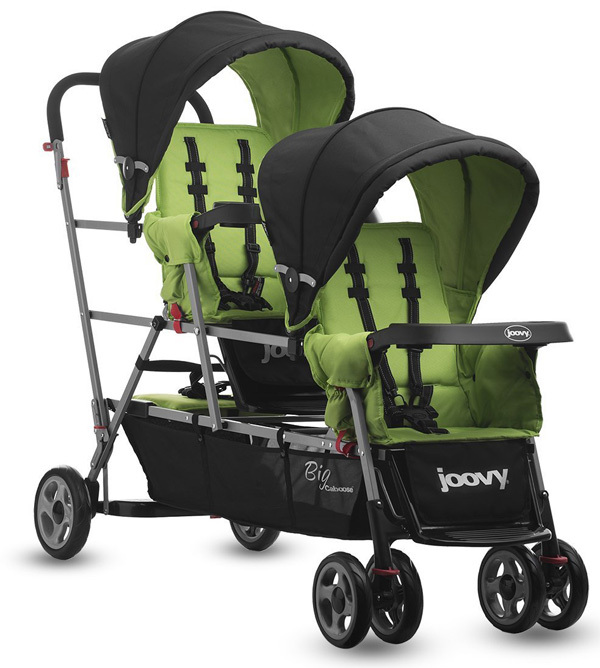 One good thing about Joovy is that it has had very few recalls since it was founded, and these have not yet been for its seats or the main strollers it makes. This stroller isn’t for the petite in stature or heart. It’s a big stroller and it takes some oomph to get it going. 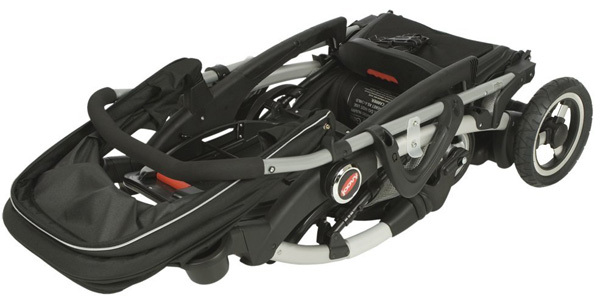 However, if you’ve got the muscle and don’t mind the push it can be a good stroller. If you need support for two seats, it’s among the best out there. You’ll also need to have at least one patient child because the sit-and-stand area isn’t comfortable for some. Their seat will be pushed around a little by the other stroller seats and some moms have said this caused fussy times and fights. You’ll also need a big car to fit the stroller. That said, it offers some of the best seating in its two main areas because it supports two car seats. It also has a lot of room between seats and gives you plenty of access to its storage. All-in-all, great if you don’t need it for three infants or if you’ve got a trooper who will be good even in a small seat during the ride.